Where to watch: RTÉ Two, Sky Sports 1. With Ireland, Slovakia and Russia joint top of Group B on 10 points, this weekend’s fixtures could prove decisive in determining the outcome of Group B.
Ireland’s rivals have home matches against Andorra and Armenia respectively, and are unlikely to slip up, so three points must surely be the aim for Trap’s men in order to prevent their opponents from opening up a points gap at the top of the pool. Despite only having gained four points thus far in the qualifiers, Macedonia are likely to prove tricky opposition. While they would have been disappointed to have only drawn their first home game of qualifying campaign 2-2 with Armenia, they gave Russia a scare, narrowly losing out to a solitary Aleksandr Kerzhakov strike in Skopje. This is the seventh occasion the sides have met – a remarkable coincidence, given that Macedonia only became a member of FIFA in 1994 following the break-up of Yugoslavia. And Macedonia will be far from discouraged by their record against the Irish, having never lost at home, with one win and a draw representing a highly respectable record for these supposed minnows of European football. With several experienced first-team players injured or doubtful, Trapattoni will be hoping that the likes of Aiden McGeady (who scored his first-ever goal for Ireland in the home game) and Simon Cox, who looks set to start his first competitive match at international level, will have the desired effect. Ireland will also hope that they are aided by the type of generous goalkeeping displayed by Edin Nuredoniski in the sides’ previous encounter, in which the Ethnikos Achnas FC man was at fault for both of Ireland’s goals. However, it is doubtful if Nuredoniski will start following these previous blunders. For Macedonia, Inter’s Goran Pandev represents the obvious threat, but Ireland will also have to ensure midfield playmaker Velice Sumulikoski does not enable the Macedonians to dictate the play, as they did in the second half of the game last March. Macedonia may be without another one of their high-profile players – Dynamo Kiev left-back Goran Popov is a doubt, having picked up an ankle injury. “He has a little problem with his groin… but we think he will be good for Macedonia. I think . . . I don’t know.” Marco Tardelli on Robbie Keane’s chances of starting the game. “I will not hide from change if changes have to be made for this big game.” Macedonian manager Mirsad Jonuz on his uncompromising approach to player selection. Who the hell are Macedonia? Email “Euro 2012 Preview: Macedonia vs Ireland”. 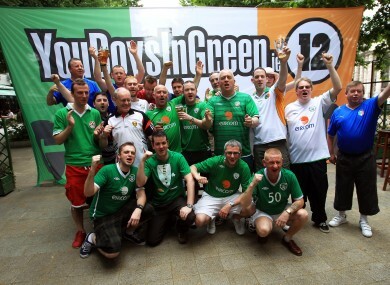 Feedback on “Euro 2012 Preview: Macedonia vs Ireland”.